By Max Sternlicht . Published on February 11, 2019. 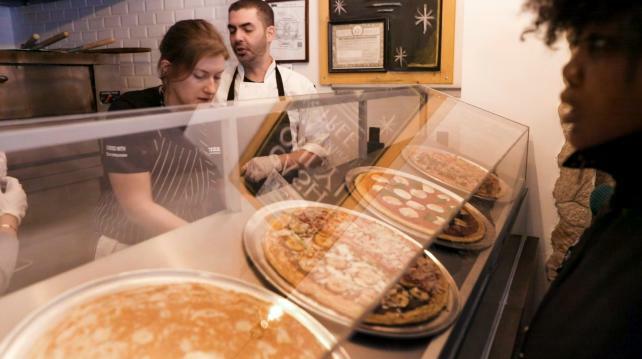 Passersby walking through New York's SoHo neighborhood on International Pizza Day last weekend might have been surprised to hear a one man polka band making a lot of noise at Bleecker Street Pizza. But IHOP had taken over the neighborhood staple for the day to give out free slices of "Pancizza" -- a pizza-sized pancake only available over the weekend at select IHOP locations. Created in collaboration with Droga5, the Pancizza (pronounced pan-keet-za) menu featured flavors such as Strawberr-oni (strawberry jam, coconut shavings and sliced strawberries), Mallo-rita (raspberry jam, marshmallows and mint), and PancizzAloha (maple marscapone, cheddar cheese, bacon and, yes, pineapple) all made to look like real pizza. (Pineapple on pizza might be up for debate, but it most certainly belongs on a pancake.) After being warmed up in a pizza oven, pancake slices were given out in custom Pancizza boxes brandishing IHOP's take on the classic winking pizza chef. Despite having forks and knives at the ready, patrons of the new Bleecker Street Pancizzeria stayed true to their New York spirit and opted to fold their Pancizza slices before eating. Also available for purchase at the pop-up shop were socks, t-shirts, tote bags and pins, all part of IHOP's PancakeWear line of clothing. In addition to the New York pop-up shop, IHOP partnered with DoorDash to bring Pancizzas straight to the homes of people in Chicago, Dallas, and Los Angeles all weekend, offering free delivery of the specialty pancakes to remind people about its delivery program. The promotion piggybacks on the absurdity of the short-lived IHOb campaign of last summer.